Oven-roasted [insert your favorite vegetables here] are easy, healthy and oh-so-good! But if your vegetables have burnt edges (or turn out limp), read on to learn how to perfect this popular dish. 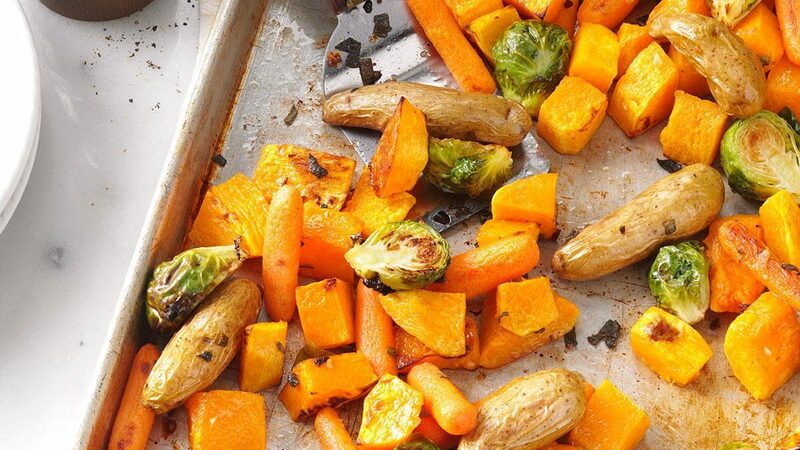 We love oven roasted vegetables! When cooked correctly, they’re sweet and tender, and you can use them for almost anything: power bowls, soups, salads or as a simple side dish. But if your vegetables tend to turn out limp, oily, burnt or undercooked, you might be making one of the mistakes below. Don’t worry, though—each one has a super easy fix! Even as a professional chef, I find myself cramming vegetables onto a single sheet pan to avoid dirtying up a second one. If the pan is packed too tightly, the vegetables will steam instead of caramelizing. The result is sad, limp, less-than-flavorful vegetables. The solution: Give your vegetables some room to breathe. Arrange the veggies in a single layer, keeping at least a quarter inch of space between them. This may mean using a second sheet pan if you’re meal prepping or cooking for a crowd. But, trust us: washing that extra dish is worth it. You might be tempted to turn the oven down if you’ve ever burned a batch of roasted vegetables, but we’d advise resisting that temptation. A low-and-slow cooking technique is excellent for vegetables like carrots, beets or potatoes that you plan to puree into soup. But, they’ll turn out soft and soggy instead of crispy and caramelized. The solution: Turn the oven temperature up to 400°F to 425°F. The high heat will quickly coax out all those naturally sweet flavors while keeping the vegetable tender-crisp. Everything will be golden brown and delicious! Do you find that some of your vegetables are burnt while others are still undercooked in the center? Since smaller pieces cook faster than larger pieces, your vegetables will cook unevenly if they’re all different sizes. The solution: No matter what cut you settle on—sliced, diced or chopped—make sure everything is roughly the same size. This is especially important if you’re mixing different veggies together to create a sheet pan supper. Too much oil and your veggies will turn out soggy and dense. But skimp on that oil and those vegetables will be too dry. Luckily, it’s easy to find Goldilocks’ just right amount. The solution: Before hitting the sheet pan, place the vegetables in a large bowl and add a tablespoon of oil. (Which oil is best? You get to decide!) Give them a quick toss and add an extra tablespoon if everything isn’t fully coated. Then, transfer the veggies to the sheet pan using your hands, leaving any excess oil at the bottom of the bowl. 5. Some Vegetables Always Burn! Okay, here’s where the frustrating part kicks in: You’re doing everything right, but some of your vegetables are still burning before others cook all the way through. It’s possible the fault lies with your oven. The easiest way to know for sure? Pick up an inexpensive oven thermometer (as it turns out, my oven runs 25 degrees under and it’s hotter in one of the corners). The solution: Once you know how your oven handles its temps, it’s as easy as rotating the pans and flipping the vegetables halfway through. In addition to turning the sheet pan all the way around, I like to swap the pans if I’m cooking on two racks. Then, use a spatula to move the vegetables around. Make sure they settle back into a single layer, or you’ll accidentally overcrowd! Learn more about our top secrets for roasting perfect vegetables, every time. Article by Lindsay D. Mattison for Taste of Home. View the original article here.